I hope you can take the time to see around my page and the different Ranger pages + pictures. It is not so that a serrated edge is always needed. 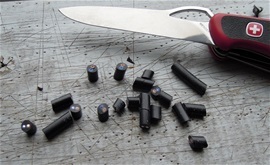 The serrations have some small advantages with rescue work. The serrations on Wenger knives work very well. The plain edge will go a long way. If people believe that the steel on the SAKs does not cut then I can assure that it can. The Ranger with the shape of the blade and the edge cuts leather like butter. It can cut almost any rope and fabric. A SAK got many advantages over just one blade because of the multifunction and different blades it can hold. The steel and normal edge on a New Ranger 130mm can cut wood, fabrics, belts and rope. If you have a large saw on it too then the destiny of the rope is sealed for sure. Hold the rope tight and just cut it off. I have explained some on how versatile a RangerGrip 79.821 is around because of the large design and functions. This tool can be used for many tasks with great joy. Most of the ergonomics and design is already made for the best safety and comfort when using it. The steel will cut for a long time and it is very easy to sharpen. It did surprise me when I used it on spruce wood. I would recommend looking on the Rangers if you can because there is a design that will surprise. Some would say that the stainless steel used on SAKs is too soft. My advice is to test first and see the cutting performance. If people are looking for a mean material then they should try this armored rubber tube. The Ranger cut it very well. The Ranger blade is slim, flexible and sharp. Interesting to try an electrical cable but it was no problem at all. Professional hunters use the New Ranger blades and steel. The ranger blade is less than 2.5 mm thick with a versatile shape and edge. It is a design master piece on a modern SAK. 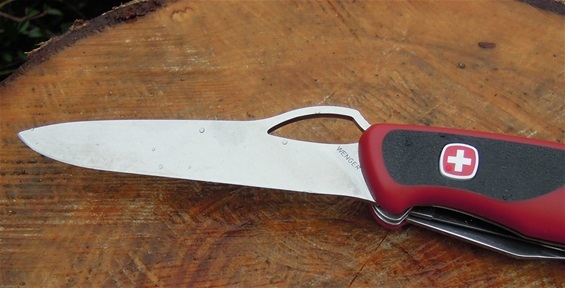 This blade is very lightweight and it can be opened with one hand. It is impressive that this slim edge can be used on so many materials. It is so easy to sharpen that I put it in with the absolute top 3 easiest ever. It is interesting that this knife can compare to some steels that many would believe to be better. It is difficult to estimate a Rockwell C on it from use. My feeling would say 56-58 HRC but I may be wrong. I have tested it on many materials and it does the job it was made for. Here is a special rope i have. I do not know what it is made of but it can take the weather or elements for a long time. It is also strong against a cutting edge. 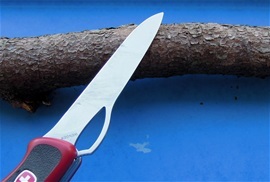 I tested it with the Wenger Ranger and the blade performed. I did cut much rope to see and the edge takes it very well! There are no changes in the edge after this little cutting in birch. The blade cuts tiles in wood very easy. Usually any knife blade in the hands of a professional is a weapon. 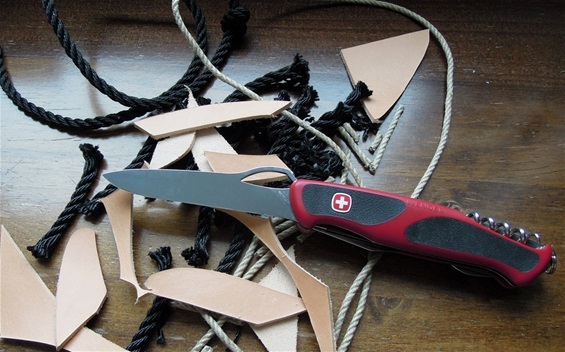 My impression with Swiss Army Knives is that the philosophy behind them is the tool for versatile uses and the outdoors needs. The SAK can be considered a formidable weapon as a tool anyway and this is because of the ability to be used on all kinds of equipment and devices. It all depends on the versatile mind that uses it. This is common knowledge and not news. If you would have a professional tactical team then different knives and tools in combination can become a set that could be considered more than dangerous. It all depends on the versatile minds behind them. In the hands of a saboteur it is obvious that that person could represent a nightmare. This is so with all kinds of tools, multi-tools, specific professional tools and devices. It all depends on the versatile mind behind it, his training and target. It can also be used to make things. For us SAK people and enthusiasts the knives and functions represent much more than the history, evolution and innovations. We have a bigger interest in it usually and it has become a valuable interest because we can pin point the quality and details. We study, collect, research and innovate too. I hope people continue to check out my edition of the phenomenon and see the quality and products. I am fully independent in my hobby and use a free mind. I am into all or everything that is not violence related. The knives and tools are made for all kinds of tasks in the everyday life. Everyone need some kinds of tools in the modern world. Even with the name Army in the product it is not a fighting weapon. It can be used on weapons and used by hunters, backpackers, sailors, fishermen, handymen, sportsmen and the list will never stop. It is Swiss and it is a Swiss product! The blade on the new Ranger knives and the locking mechanism is not made for fighting and the philosophy behind it is a bit special..It is a versatile knife blade and tool! There is a difference in wood work and using the knife in the outdoors. Sometimes you hear people mentioning finding wood that is clean without other twigs grown out from them. For example a tree branch that is clean from twigs and other abnormal growth. This depends on what you are going to use it for. Wood that has grown in all directions and woven strong can be excellent for knife handles and such. This is usually not needed for the outdoors. If you want to have a wood that are easier to cut then the clean grown wood are easier to cut. 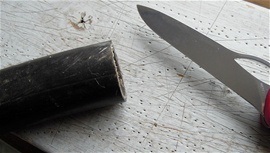 It is as simple as cutting along the wood and long tiles can be removed whittling with the knife. I guess most people have experienced cutting on an area with a twig and how everything just stops and you have to more carefully cut around that area until it is gone or you can continue whittling. The New Ranger knife works very well on soft to medium hard wood but for sure you can cut harder wood and even masur-birch, it just takes some more time. Harder wood is usually denser and therefor it takes more time to cut the wood into the shape or tool you want as well. 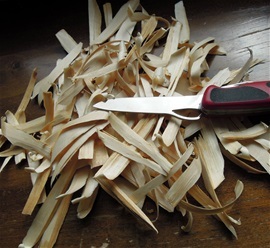 With wood that is woven in different directions it will naturally only be possible to cut small bits at the time. Using force on the masur-birch will only damage the edge and work up a sweat. Some wood are easier to cut when wet and other not. There are different woods for different jobs just like there is different knife steels. The New Ranger steel cut deep cuts in spruce without trouble. When cutting wood that is grown in one direction (symbolically that said) you feel that when the correct angle and depth is there and hence you can follow the wood cutting of longer tiles of material. If the cut is too deep it will only stop and you will have to use force. It is usually not much force needed to cut wood and it will save the edge and construction if you are lighter on the hand and how you cut. It is important to read the material you are going to use. It is important to remember that it is not uncommon that people get injuries from cutting wood with twigs or abnormal knots or growth. People will use the blade in uncomfortable angles and use the blade in the wrong direction. It is not smart to cut towards the body. At one point the place you are struggling with can slip and you may get a nasty cut. So never against the body is the rule. It is much better to turn the wood in different direction and cutting away from the body. It may sound banal what I am explaining but it is no joke because people have died from wrong use. There are known examples of this with different knives. It is better to use time rather that force and speed. I am not reluctant to use force on a blade for testing and sometimes it is the only way to learn the quality. Sometimes it also requires force to cut a material anyhow. With experience you will be able to hold the blade in a direction that for some may look like you are cutting towards the body. 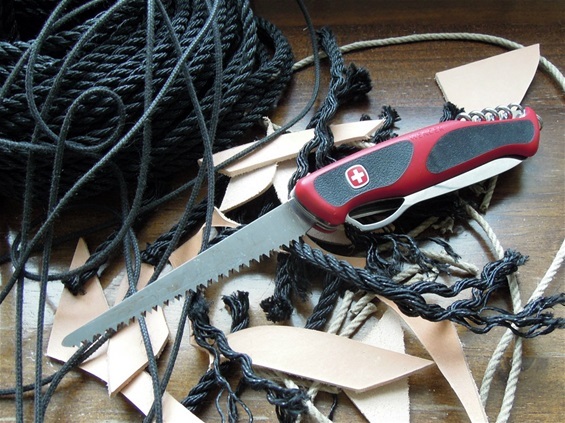 Experienced people know that at one point depending on the material you cut if it is wood, rope, webbing or other the edge will go through the material and into a direction. For example cutting layers of rope you will have in mind that when the edge go through the material it will go in an angle away from you and you will counter it many times and stop the motion momentarily the edge is through the material as well. The key is a direction or an angle that will go to the side and if you should not be able to counter the swing it will go past you. When you are cutting around other people then it is important that you do not use uncontrolled force and the edge go through the material and you swing the arm out, this can be very dangerous in deed. The New ranger knife got some serious advantages with the grip and evolution handles. It will be possible to grip the handle even when wet with control. The shape and the design on the handles will very much influence the safety. 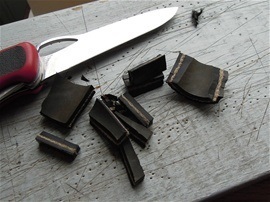 Using folding knives in different directions and grip depends on the quality. 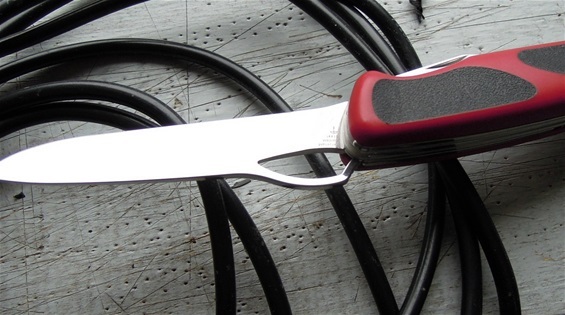 A high quality Wenger knife can be trusted. With experience you will be able to use the arms and the body anatomy to get the best angle and momentum. You will be able to cut in many directions away from the body. What you can have in mind is that in knife fighting the balance is just as important as when cutting wood. If you are standing up then you must remember the balance and that if you use force and the arm swings out then you may fall. It is typical that people cut themselves falling. The blade can fold over the fingers if you do not have a lock. Another important factor with knives is the grip you use. People must not forget to always have a secure grip, if not the knife may slip or turn in the hand and you get a cut. I am not interested in fighting weapons anymore but i do know that if you want a fighting knife then the SAKs are not the correct choice. It is made in the tradition and not for violence. A fixed blade knife can be drawn faster and with a speed that is formidable. It is a completely different hand philosophy and strategy. Switchblades or illegal knives are just a joke compared to a fixed blade. 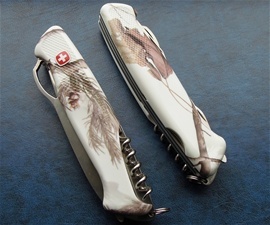 Folding knives and Swiss Army Knives are versatile tools and they are excellent rescue and safety knives. In some cases they are better than a fixed blade yes! "Wenger designed a world class category of knives with the New Ranger knives. I can mention again that the HRC used on them are 55-58. If one should be precise the upgraded steel are HRC 57+. They are late 50s in hardness with that flexibility Vs hardness that was a Wenger secret" The steel outperformed what are considered better steels from other manufacturers"
Hi.Thank you very much. I can recommend getting a New Ranger because they are some of the most interesting knives i know and improved.